Park Lofts offer studios, one and two bedroom Lofts tailored to fit your unique style and taste. Lofty 12 to 20 foot ceilings and exposed brick are features you’ll find. You’ll be walking distance to parks and other attractions. Please give us a call and take a personal tour of our community. Take a 3D Walkthrough Tour! Park Lofts is listed on the National Register of Historic Places. Constructed in 1912-1913, the Sears, Roebuck and Company building served as an early anchor for both the North Kansas City central business district and its central industrial district. The design has its roots in the Chicago School of Architecture and can be placed among the best of the industrial designs of the first decades of the twentieth century. Designed in what its architect George C. Nimmons called Industrial Gothic, the overall horizontality of the building, emphasized by the configuration of the ribboned arrangement of windows and counter-balanced by the verticality of its piers and the tower-like end bays. Gothic styled embellishments, rather rare on an industrial building animate the exterior. After serving Sears for several years, the building was the location for a soldiers barracks and mechanics training camp during WWI while truck, tank and airplane engines were stored in the upper floors. At the close of the war, the building became the home to several prominent businesses including The National Bellas Hess. In 1997 a group of Kansas City businessmen acquired the building and converted it from commercial use to 152 loft-style apartments. In 1999, when the $15 million dollar conversion was complete, the building was reopened as Northland Lofts. In 2016 the property was rechristened Park Lofts. 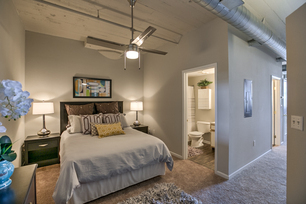 Park Lofts is undergoing a substantial renovation with upgrades to its loft style units. 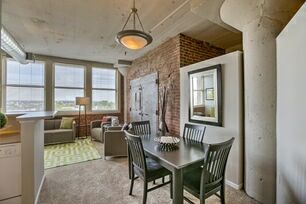 The spacious units feature high ceilings, exposed brick and large windows with expansive views. First floor units have 20’ high ceilings with double rows of windows while certain 9th floor units feature skylights.